There is a saying that dogs are man’s best friends, therefore we need to take care of our puppies accordingly. So in order to provide sufficient safety and a great outdoor or indoor play area for our pups, there are many different kennels available. There are kennels which can be used either indoors or outdoors or even in both situations. Then there are many playpens that can be assembled and set up as needed, and changed according to the situation which will be helpful especially if you have a growing puppy. And, then there are kennels that are meant for traveling, to ensure that your doggy feels safe, protected and comfortable whilst on the road. Overall, there are many different kennels, with different purposes and applications, but in order to help you figure out which is the most suitable kennel for your personal needs, here is a brief review of the best kennel for dogs. 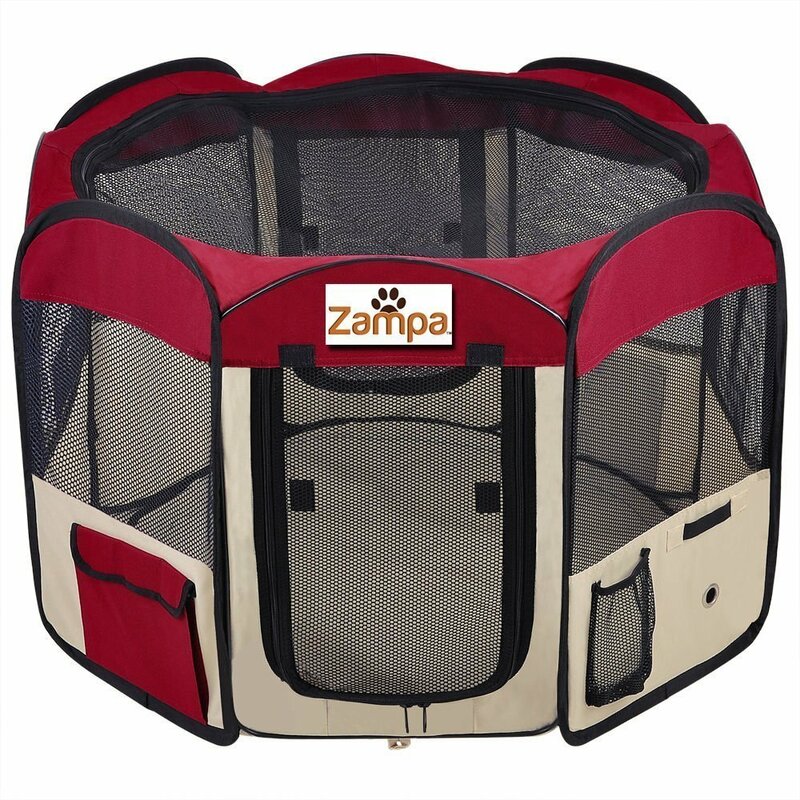 Zampa is an international company which offers all kinds of pet products from safety belts to playpens and even grooming tools. Their main concern is creating a product which will help pet owners and pets themselves. They produce their products out of the best materials in order to create a safe environment for your pet and yourself. Therefore when purchasing from Zapma you can expect the products to be well made and qualitative. 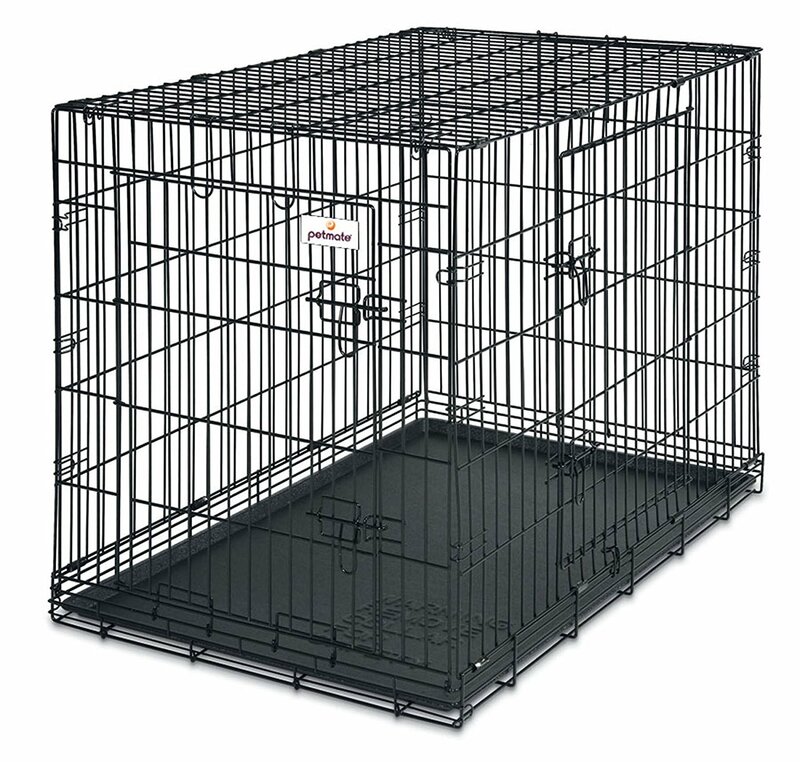 This is an eight-panel kennel, with protected seams and reinforced corners for the safety of your pet. The kennel is made out of water-resistant materials so you can use it outdoors and in different weather. The Zampa dog kennels are lightweight and portable, so you can take them with you on trips and different adventures. The kennel is easily set up and advertised to be easily taken down, but in reality the taking down part takes time and is not as simple as advertised. But, once you manage to take the kennel down it is foldable and will take up little space. The Zampa custom dog kennels have an attached floor which can be added to the kennel whenever needed. As already mentioned the kennels have reinforced corners and protected seams in order to avoid any possible accidents and trauma. On top of that, the Zampa dog kennels are made out of water-resistant material, therefore, they are durable and long-lasting. Kennels are spacious and will give enough room for small and middle-sized pets, but the bigger breeds might not fit the Zampa kennels. And, four stakes are included so you can secure the kennel safely outdoors, by sticking the stakes into the ground. All in all, Zampa manufactures great kennels for dogs that are long-lasting. 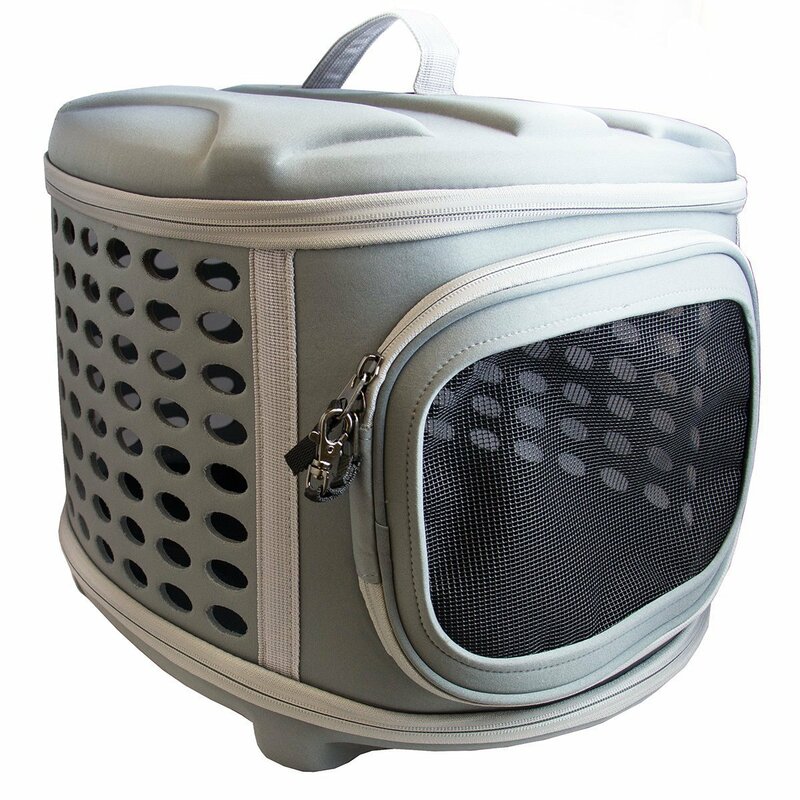 The 45-inch pet kennel also includes a water dispenser hole, where you can attach special water bottle, a water bottle holder, an extra water bottle and exterior side pockets, which are meant to store treats, supplies, water, and personal items which might be needed for your pet. Primetime Petz is an international company selling their products all over the world, in retail stores and also through online stores. They sell different pet products, for taking care of our pets and making their life and our life easier and more enjoyable. Although Primetime Petz produces different ranges of pet products, all of them are high quality and are made using well-considered materials and designs for your pet’s safety. The Primetime Petz kennels for dogs are a safe and comfortable place for your dog to sleep and have a downtime in. The kennel is designed for larger pet breeds as they have fewer options when it comes to purchasing a kennel. Many producers do advertise their kennels as fitting for larger pets, but in reality, they are too small and can be easily ruined by large pets. But the Primetime Petz dog kennels are specially designed to fit breeds which are larger and to securely hold the pet inside the kennel. The design of the Primetime Petz best dog kennel is stylish and will go well with your furniture. The kennel is elegant and at the same time functional, as the kennel has a table surface and can be used as a coffee table in your living room. The latch that is added to this kennel is decorative oil because it is coated in a bronze color, adding, even more, elegance and style to the product. Also, there are protective pads added, which will save your floors from scratching. And, if you are worried about assembling the dog kennel, then you can calm down because the Primetime Petz custom dog kennels come almost assembled and you can put it together within minutes. All in all, this is a stylish and modern pet kennel, which will not only serve as a place for your pet to sleep and rest in but also for disciplining your pet. As the Primetime Petz dog kennels come with doors that can be secured. But, with the design comes a price, therefore this product has one of the highest dog kennel prices, and will not be one of the cheap ones. But, if you are not looking for a cheap kennel, but one that is stylish and a bit larger, then this kennel will be a perfect choice. Confidence is a producer of differed products designed for home and personal use. One of their lines include kennels for dogs which are made out of great quality materials and will be long-lasting and durable for indoor and outdoor use. As the materials and quality are high also the dog kennel prices are considerably higher. But, if you consider the quality and design of the product, it is worth to invest in one of the Confidence dog kennels. 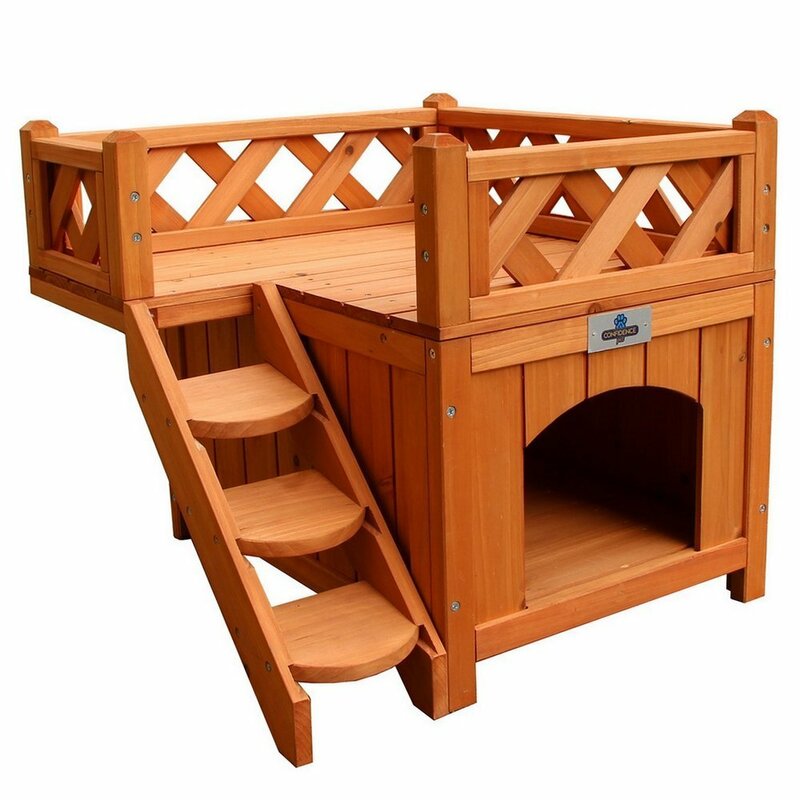 The Confidence wooden pet house is a great quality kennel which is very sturdy and long-lasting because it is made out of furniture grade wood material. The pet house comes with an added benefit of a balcony, which is not only fun for your pet but also looks stylish and innovative. The Confidence dog kennels are solely made for your pet to relax, play or sleep in, so it won’t serve as a tool for disciplining your pet. These kennels for dogs aren’t designed for restraining because they don’t have a door or any kind of gate installed, and your pet can freely walk in and out of the kennel whenever desired. Although it is sturdy and high-quality pet kennel, only small and medium-sized pets will feel comfortable in this best dog kennel, as it is only 20 inches x 20 inches x 18 inches in dimension. Also, there are cute stairs added for pets to easily climb onto the balcony, but the size of the stairs is an issue. As the design of these stairs is quite uncomfortable for pets to actually use them, they are too steep and narrow. Overall, this is a great pet house if you are looking for a stylish and nice looking dog kennel. It can be used indoors and outdoors and although made out of furniture wood, it is easy to set up. But, once you do set up these custom dog kennels, it will probably stay in that place for some time, because these dog kennels are quite heavy due to the materials they are made out of. Lucky Dog is a manufacturer which concentrates on offering dog care products, which are intended to create a pet-friendly environment in your house. They create different products starting from accessories to kennels and dog houses, which can be used anywhere you like and can be even taken with you on trips. And, if you choose to purchase from the Lucky Dog, you don’t have to worry about the safety of your doggy as they carefully select the designs and materials in order to ensure that their products are completely safe. The dog kennels manufactured by the Lucky Dog are made out of durable and long-lasting material – heavy-duty welded steel, which will keep in even the biggest and most active pets. It is perfect for either residential or even professional use. And, as already mentioned, Lucky Dog is highly concerned with the safety of every pup, therefore the wire mesh is welded before coating in order to prevent any sharp edges which might cause harm to humans and pets, and, moreover, it will prevent any corrosion or rust making the kennels for dogs extra long-lasting. 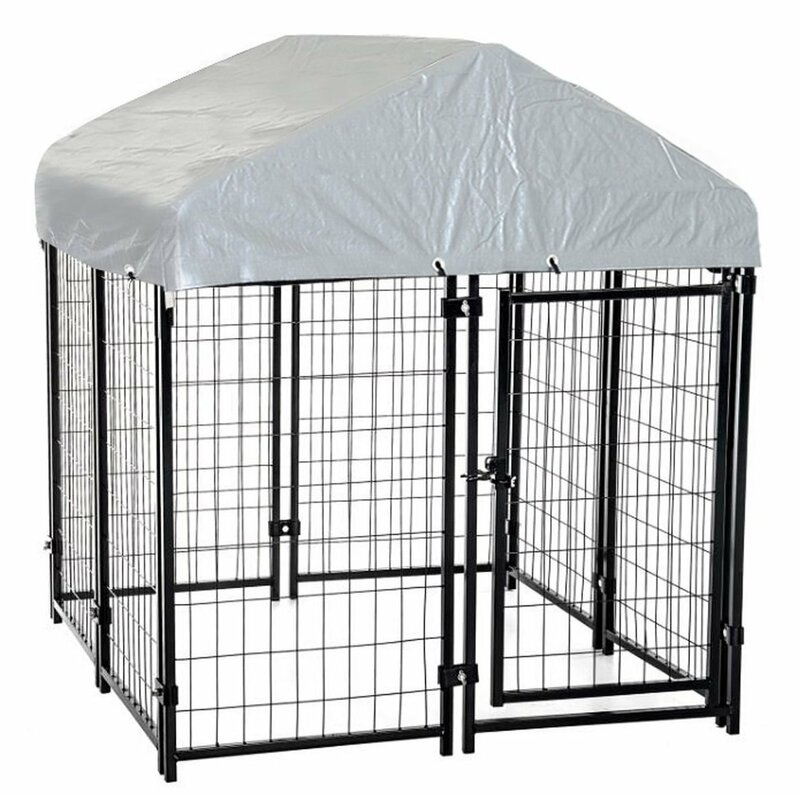 When you are purchasing any of the Lucky Dog Uptown Welded dog kennels a waterproof cover is also provided, which will protect your dog against UV radiation. The cover is heavy duty with a steel roof frame which will perfectly fit the outdoor kennels for dogs. The legs are raised for 1.5 inches from the ground so that all of the areas inside the kennel can be reached comfortably. But, this makes the kennel suitable only for larger pets and dogs, as smaller ones will have no difficulties getting out. Overall, a nice kennel, with a safe design. A lockable gate is included, which can be easily opened, closed and secured with a latch which is firmly made and will keep your pet from getting out. But, the door itself is very narrow and can get quite uncomfortable. Advantek is an international manufacturer of different home appliances, including producer of enclosed dog kennels. They are producing not only products aimed for pets and dogs, but also for different purposes and needs, for example, insect repellents and traps. The Advantek Pet outdoor kennels for dogs are very low-profile and will provide great protection for your pet. Kennels have an access window, which will help you to clean the kennel or feed your doggy, and this access window has a secure latch, making it safe and secure. In order to keep your pet safe for different weather condition and sun, the producer has included a reversible weather resistant polyurethane cover which goes nicely on the top of the kennel. When you receive dog kennel from Advantek you don’t have to worry about assembling them, as they are easy to set up and take down whenever needed and won’t require any tools. Considering the overall dog kennel prices, the Advantek Pet kennel is relatively cheap and affordable. Overall, a great and secure pet kennel, which is designed for outdoor use only and will be great for any outdoor area, or backyard. The only thing is that the kennel shouldn’t be placed on hard surfaces because the kennel cannot be secured on hard surfaces and will be easy to push around. Pawhut, the manufacturer of an outdoor covered pet kennel, is an international company, providing different care products for pets, mainly concentrating on dogs and dog owners. They have created a trustworthy brand which is known all over the world. Providing their products in different stores and through online retailers, Pawhut has grown a customer base which chooses their products and is loyal to them as a manufacturer. The Pawhut outdoor covered pet kennel has everything you will need and will be easy and quick to assemble. But, as stated already in the name of the product, it is only meant for outdoors. Meaning that if you are looking for a kennel which can be used indoors and outdoors and will be flexible regarding this aspect, you might want to look at other pet kennels. But, if you are searching for an outdoor dog kennel, then this is a great option because Pawhut dog kennels are equipped with a weather and UV resistant canopy, offering protection from rain and the sun. And if you wish to enlarge kennel it is easily done with additional panels, because they are made to easily fit together and assembly without any difficulties. Overall, Pawhut professional dog kennels are a great option if you are looking for an outdoor kennel, which is going to last for ages and protect your pet against rain and the sun. But, if you have a smaller pet, be aware of the gaps at the bottom of the kennel, as they are quite wide and small animals can easily get through these gaps. And, also, ground anchors are not included, but without them, it is going to be easy to tilt over the kennel, therefore you might want to buy them separately. Precious Pet is an international company manufacturing and producing different products meant for pets and pet owners. Their products are trustworthy, safe and designed to provide the greatest results. One of their most popular products is custom dog kennels which are sold and used all over the world in different countries by many people. And all of them have admitted that Precious pet kennels are designed and made well and with outstanding quality. The Precious Pet kennel is a great place for your pet as it is safe and comfortable for both – owners and pets. 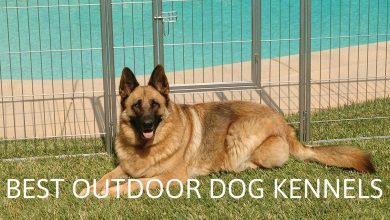 This is a perfect choice if you are looking for an outdoor kennel, which can be also used indoors when necessary. The design of the kennel allows you to configure and create any form you need. So it is not only great when in use but also easily stored. The kennel also has a built-in a gate, which ensures easy access to your pet and to the inside of the kennel, for maintaining and cleaning. The dog kennel designs allow you to create any size and form kennel or playpen necessary, and due to the materials used, the kennel is durable and rust-resistant. The decorative silver crack finish is one of the best dog kennel coating finishes you will be able to find online and in stores. The Courtyard Precious Pet kennel set comes with a set of long and short removable corner pins, the long stakes are used to pin the kennel into the ground so that it does not move out of place. And the short pins are used to help you assemble the kennel when used indoors or on hard surfaces when you cannot pin stakes into the ground. The slide down design of the long and short pins, ensure for fast and easy assembling. And, if necessary, you can easily fold the kennel flat for storage or transportation. The Best Pet Company is the producer of different animal and pet products, including this pet fence, which can be assembled in many different variations, including a kennel. The Best Pet Company sells worldwide and has been providing great quality products, with great designs. 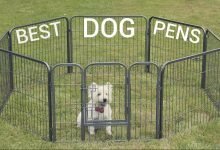 The Best Pet kennels and playpens have been designed for owner comfort, pet safety, and to be as versatile and comfortable in any situation needed. 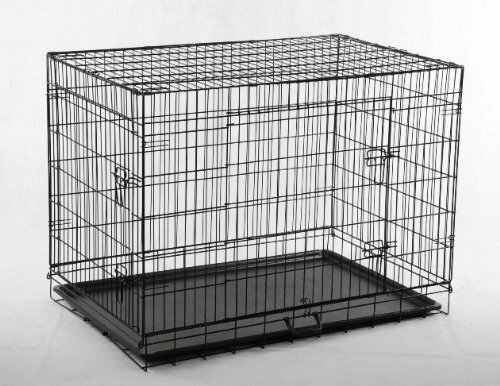 The kennel is made out of strong wire which is very durable and, therefore, long-lasting. The expose-coating ensures that the metal wires are rust and corrosion resistant. And the powder coating makes the kennel fade resistant even if subjected to direct sun rays. The kennel is easy to set up and take down if necessary for storage or transportation. So it can be taken on trips and on vacations. 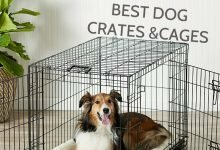 Although the Best Pet crate is marketed as a kennel, for a pet to have a place to rest and spend time, it can also be used to train your pet, or for other different purposes, for example, restraining your doggy. You can use it either indoors or outdoors, but if used on hard surfaces it will be easy to move around and can scratch your floors. The one downside of this dog kennel is that there isn’t a door included, which makes it a bit tricky when putting in or taking out your pet, or if you want to clean the inside of the kennel. And, because of its lightweight, it can be pushed around easily if not secured, so it will be best to use outdoors. But otherwise, this is a great pet kennel and playpen area, made out of durable and portable metal panels. The Pet Safe manufactures different products intended for pets, more precisely for dogs. 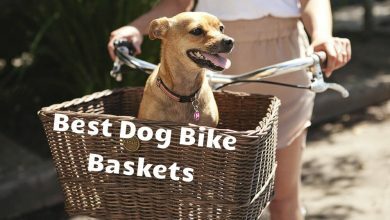 They have different lines, which are meant for keeping your dog comfortable and making your life, as a dog owner, easier. They sell their products in many different countries and parts of the world, selling through online retailers, which helps them to reach a larger audience of customers. 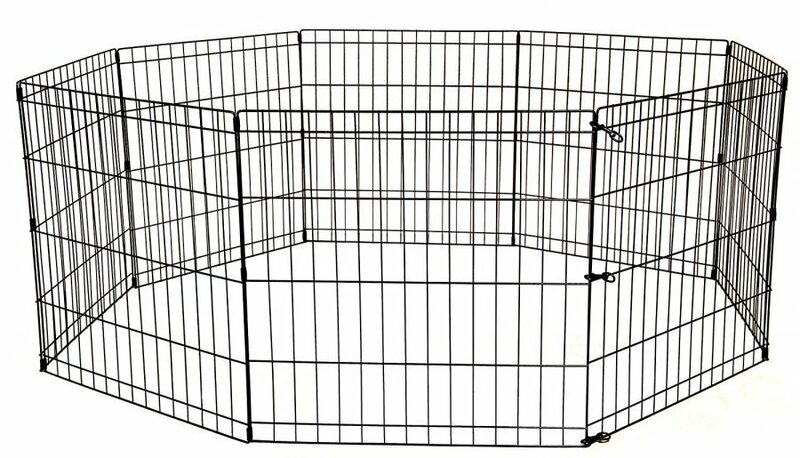 The Pet Safe dog kennel is made out of welded wire, which isn’t too heavy but will still keep your pets inside. But, if you have a pet which likes to chew on things and is known to ruin things, then this pet kennel will not be very long-lasting. It is coated in a rust-resistant powder ensuring that the kennel lasts you for several seasons through various weather conditions. Manufacturers have included a sun block top, keeping your pet in shade and protected from rain. Although the kennel is meant to be used only outdoors, you can be sure that the Pet Safe kennel is a great investment because of the durability and versatility of its panels. All in all, Pet Safe offers a durable and long-lasting dog kennel because of the rust-resistant black powder coating. The Pinch-proof gate can be configured to open either to the left or right. Also, the several panels ensure that you can set up the kennel in any way you want, as it is versatile. And, you will have no problems to set this kennel up, because for one person it is supposed to take up only an up to one hour. Lastly, if you want to enlarge it, there is a possibility to expand the kennel with extra panels which can be bought separately. 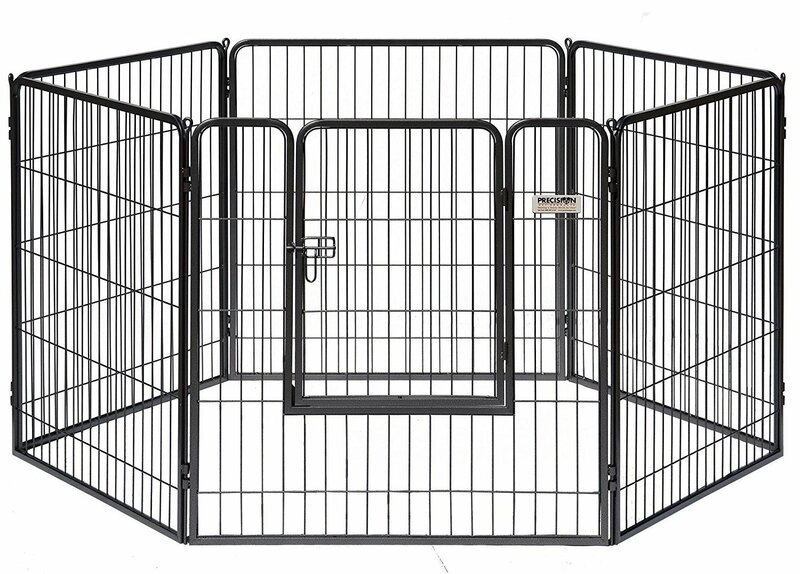 As already mentioned The Best Pet Company is the producer of different animal and pet products, including this pet fence, which can be assembled in many different variations, including a kennel. They offer their products all over the world and sell through online stores but also providing their products in retail stores, reaching as many customers as possible. If talking about the dog kennel designs, the kennel has a black powder coated finish, which protects it from rust and keeps metal wires long-lasting and durable. The producer has included a slide out plastic tray which will make the process of cleaning the kennel easier and more convenient. You can even take out and clean the plastic tray without disturbing your pet, as it can be done with doors closed. The best dog kennel has also two doors, one on the side and another one on the end, which will make the kennel and, therefore, your pet more accessible. 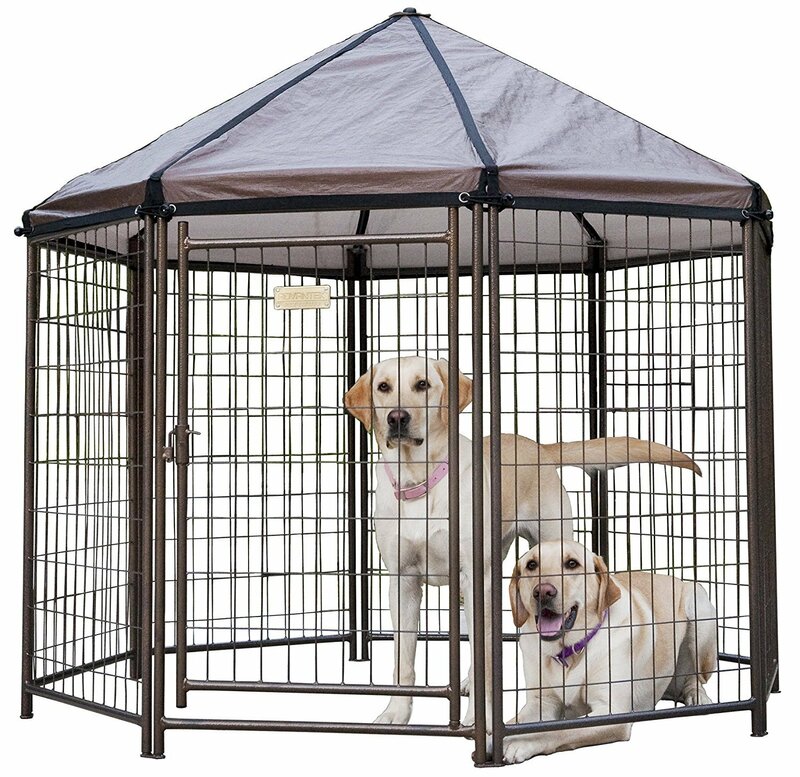 The Pet wire cage can be used indoors and outdoors, and as it is lightweight you can switch up its locations quite often, and even take the best dog kennel with you on trips and vacations if needed. The company manufacturing these custom dog kennels is called Petmate. They are an international company, providing their dog kennels and dog kennel designs in many parts of the world and in more than thirty countries. Their great quality products have earned them a trustworthy and reliable status among customers. This the best dog kennel has easy and secure door operation system, which has a five-point lock system, ensuring that your pet won’t be able to open the gate itself, eliminating any possible gaps in the top, and increasing the strength of the door overall, so that there isn’t even the slightest possibility of your pet breaking out of the kennel. This is not only perfect for creating a play area for your pet but also for training and teaching them discipline. There is no assembling required as this dog kennel comes already put together. The kennel folds easily and is flat for easier transportation and storage. The coating of the kennel is rust-resistant and will be long-lasting, keeping the kennel looking fresh and new for several seasons. There is a durable, removable polypropylene pan included which will help you with maintaining and keeping the kennel clean. And also the divider panel helps to adjust the kennel to the necessary size if you have a growing puppy. Trixie, an international company manufacturing different home appliances and personal use products, including pet healthcare and pet accessories. 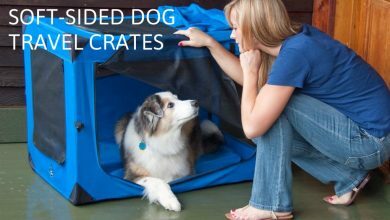 They are a well-known producer among dog owners as their kennels, crates, and accessories are great quality and easy to use. 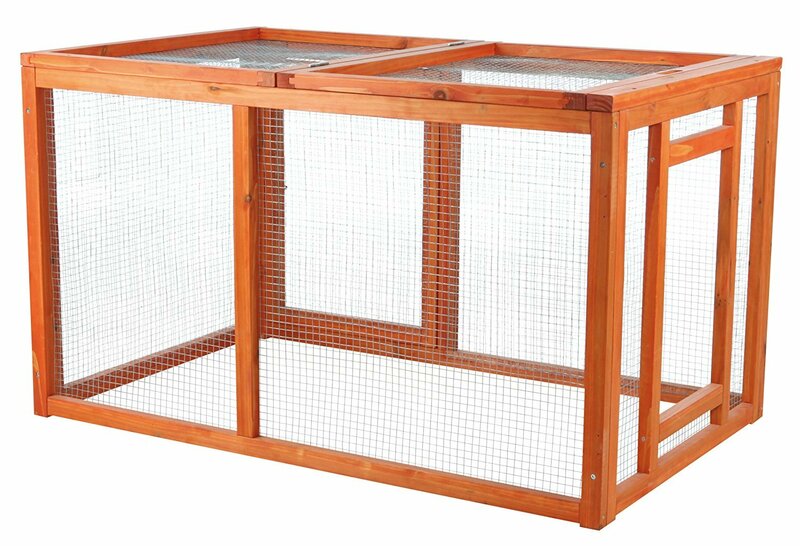 The Trixie Pet outdoor run with a mesh cover is meant to be used as a chicken house, but it is widely used as a kennel for dogs and puppies because of its stylish design and durability. The parts of the kennel attach easily and won’t require a lot of work when assembling it. Metal latches ensure the safety of your pet and ensure that your doggy won’t be able to escape from the playhouse. There is an opening in the mesh cover on one side, and a large side door ensuring that you can easily access the inside of the kennel and you will have no difficulties cleaning it. But, as it is meant for chickens, the kennel will be comfortable and appropriate only for small dog breeds and puppies which are smaller in size. 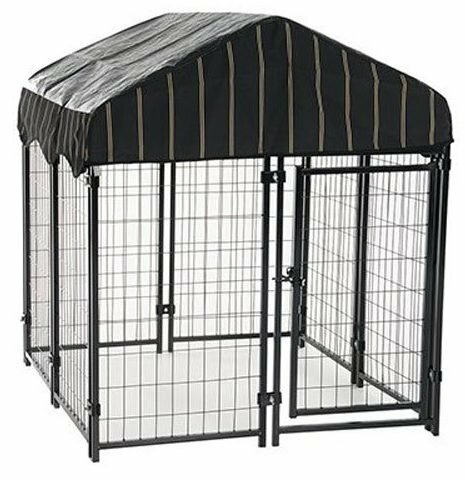 Overall, the kennel is very stylish and will look good in your backyard, as it is made out of wood and will go well with your outdoor furniture or patio area. However, as it is made out of wood, pets with chewing problem will be able to ruin and chew up the playhouse and easily get out. However, if you have a smaller pet without chewing problems then the TRIXIE outdoor kennel is a perfect choice. Pet Magasin is an especially pet oriented company that provides different products aimed at pets and pet owners. Their collapsible pet carrier is designed to give you the best of both worlds – hard and soft kennel. 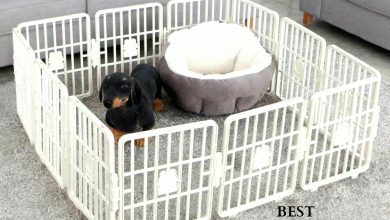 The size of this kennel is suitable for small pet breeds or even middle-sized pet breeds, but larger pets and doggies will not be comfortable in the kennel. The hard top and hard base of the kennel provides you protection and ensures that the carrier is sturdy enough for your dog to feel comfortable in it. A firm surface to stand on is a major advantage as many similar travel kennels don’t have such design. 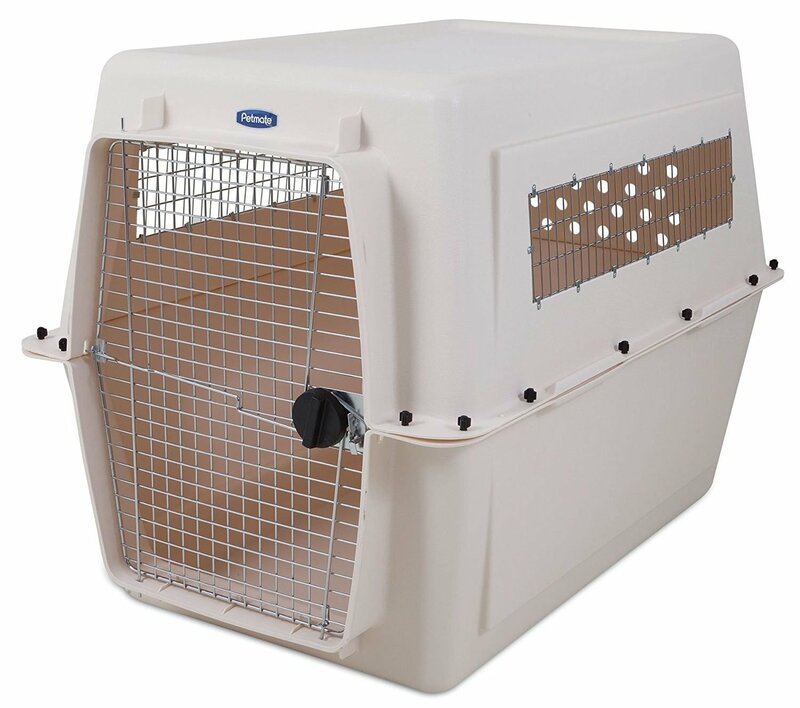 The soft sides of the carrier can be folded down in order to decrease the size of the kennel so that it is easier transported and stored when not in use. The top and the bottom come together and can be attached to each other using the zipper. So, when folded down, the kennel takes up little space and it is more convenient to store the products. The padded mat in the floor provides your pet with a comfortable and at the same time sturdy and safe place to lie down, yet a the nonslip surface ensures that your doggy is going to be able to stand on his feet without any issues. The see-through mesh door provides an opportunity for your pet to be able to see what’s going around, which is very helpful since the major cause of separation anxiety and stress for animals when they are placed in kennels and crates are that pets cannot see what’s going on around them. 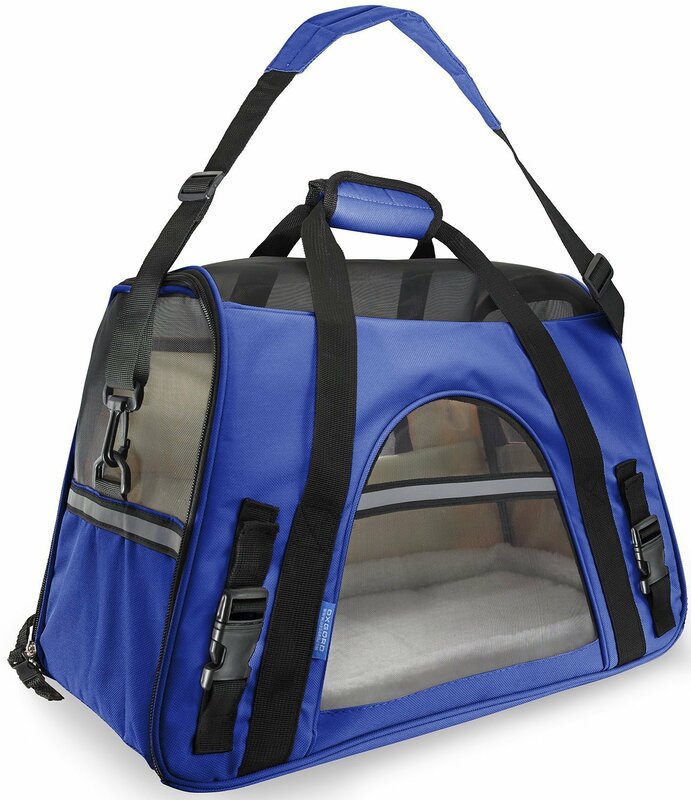 Overall, this is a great pet carrier, a very different from other dog kennel designs, but it will still be not only comfortable and nice looking but also safe and appropriate for long journeys. The company manufacturing these best dog kennels is called Petmate, which an international company, providing their dog kennel designs in many parts of the world and in more than thirty countries. They have gained popularity among customers because they offer great quality products that are trustworthy and reliable. This is a perfect option if you are looking for a kennel with a purpose of traveling or training your pet. The materials used in production are durable and will be successful in holding your pet in. The reinforces sides will ensure that any outside forces will not harm the kennel and therefore your pet. The rear ventilation and metal side vents ensure that your doggy will have fresh air at all times and that he won’t be overheating inside the kennel, which is crucial when traveling long distances. The kennel is designed so that it is valid for use in most airlines and the pet will have enough safety and comfort. The kennel is easy to assemble and won’t cause any difficulties to you. 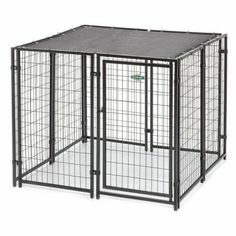 This is the best dog kennel if you are looking for a crate which is going to be safe for use when traveling but also can be used for training purposes. Paws & Pals is a seller of different products and appliances, designing comfortable and at the same time practical and stylish products. Their techniques and materials used in production have been researched and are following the accepted standard rules for traveling and transporting animals. Their main focus is to provide the safest and most comfortable pet kennel for your pet when you are taking them with you. The Paws & Pals kennels are compliant with the rules and regulations of most airlines, so you won’t be facing any difficulties when traveling with your pet by plane. 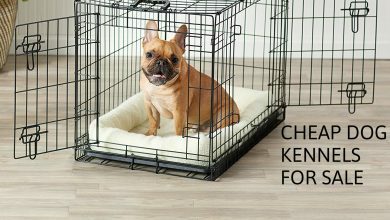 The special unwind and bind feature makes sure that you can access your pet at any time, without having the risk of your pet escaping from the kennel. This best dog kennel comes with removable fleece travel bed, a padded shoulder strap, lost and found a tag which goes in the kennel and a storage compartment for treats, special toys or any other accessories your pet might need while on the go. The kennel itself is made out of durable, comfortable and breathable material to provide the best comfort possible and to ensure that your pet won’t be too hot and overheating. Thanks to the materials used in production the kennels are easily maintained and cleaned, as they can be washed in washing machine. Overall a great option if you are looking for a kennel in which you could transport your pet, as this one isn’t meant for permanent use, only while traveling. And the size of the kennel will be comfortable and appropriate only for small or middles sized breeds. 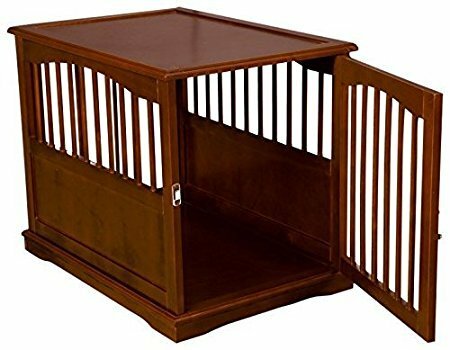 But overall, a great kennel design, which is stylish, comes in many different colors, but still is safe and does a great job. The product might have a strong chemical smell when you first receive it, but after the first wash it should fade away, so it isn’t a major problem since the kennel is washable. All in all, there are countless dog kennels provided by companies all over the world. In order to find the best dog kennels, that will be perfect for your pet and fulfill all your and your doggie’s needs, you need to decide the purposes that the kennel is going to have to fulfill. There are different kennels meant for indoors and outdoors use, and there are some that have to be set up outside. Also, there are kennels which are easily portable but some must be set up and left in one place for longer periods. Then there are kennels specially designed for traveling. On top of that, there are many different styles and materials used in the production of dog kennels and different sizes made. So in order to find the perfect kennel for your pet, you need to consider the size of your pet, where you will set it up and will you need to take the kennel with you on trips and change its location often. The quality and usefulness will largely depend on your choice. However, keep in mind that the kennel can be qualitative and stylish but if it is not comfortable and appropriate for your pet’s needs, then said pet kennel will not be the best option. So choose wisely and ponder all your needs before buying a kennel for your dog.